I grew up with many inspirations, one for real and rest, from my father reading to me voraciously in my childhood. And when boarding school happened to me at the age of 14, – he wrote the most beautiful letters to me. He would pick out inspirational lines from books and quote those in his letters. This also came from the fact that – as a child, I had a speech disorder and my father constantly, tirelessly and with a glint in his eyes kept my morale up every waking moment of my life! There is one inspiration that is hard for me to forget! 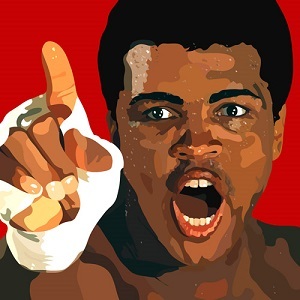 I don’t think my father realized how much his reading and talking of Muhammad Ali – the great boxer, had influenced me. On a certain occasion in my student life – when I called him to cry my heart to tell him how pained I was – he only said one thing – Impossible is Nothing ( He knew a time would come when he would have to let go of me and let me understand the difference between possible and impossible). However, the innocence of those days gone by drives me and how!!! I grew up trying to draw water from the well of everything impossible – making lots of mistakes, picking myself up, trying again and again ….and as always, there are enough naysayers and realists – But I see possibility everywhere! I recommend the book Soul of a Butterfly and The Greatest : Muhammad Ali for some dwelling on how his life turned out to be a constant inspiration for every generation!